…and now I do requests! A little while ago, I had a lovely email from an old puffineer who was kind enough to tell me a little of her affection for the club and also asked if I had a copy of Puffin Post with her in it. The clues were a bit cryptic, but I vaguely remembered the picture and went in search. Anyway, here it is Candida! I hope it was worth the wait! This is a picture of Candida with Bernard Cribbins at the 9th Puffin Show in 1976. The Robot was made by Candida and her sister (although her sister was too big to fit in it!). It’s fitting that I should put up a picture of Bernard, as he is just approaching his 80th birthday! Many Happy Returns on the day! 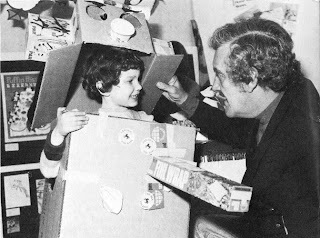 Bernard Cribbins is fantastic – he also used to conduct charity auctions at my father's industry association, although I never got the chance to meet him. Great work finding the photo! Glad to have done it. Our childhood experiences mold and inform our lives – one of the reasons I started this blog in the first place. It looked like great Puffin Exhibition. I'm quite jealous not to have been there. I agree, Bernard Cribbins is brilliant (an overused word these days, but quite right in this context).